The traditional way of repairing broken teeth is either with dental fillings or crowns, but there’s another, less well-known tooth restoration option. Dental inlays and onlays are an option halfway between fillings and crowns. While fillings are placed in the dental office and molded into place, inlays and onlays are made specifically to fit the damaged area of a tooth. Dental inlays and onlays are an option halfway between fillings and crowns. While fillings are placed in the dental office and molded into place, inlays and onlays are made specifically to fit the damaged area of a tooth. Inlays fit into tooth a tooth cavity, or hole. Onlays (sometimes also called partial crowns) are used to fix damage to a broken tooth when one or more tooth cusps broke off. Dental inlays and onlays are made with precision to precisely fit the area of the tooth that’s damaged. Dental onlays can often be used in instances where a tooth is too damaged to hold a dental filling, but the damage isn’t extensive enough to warrant the use of a dental crown. Dental inlays and onlays can be made from a variety of materials, such as gold, porcelain or composite resin. However, because composite resin isn’t as strong as other alternatives, it’s not typically as popular. Why Use Dental Inlays and Onlays? Durability: Over time, traditional dental fillings will cause the remaining tooth structure to weaken. Conversely, dental inlays and onlays can actually help strengthen the remaining structure of a restored tooth. Inlays and onlays also tend to have a longer life expectancy than regular dental fillings. Preserving Natural Tissue: Dental onlays can be used instead of dental crowns. Because much less tooth tissue is removed to place an onlay compared to a crown, this helps to keep a tooth as close to its original state as possible. Aesthetics: Dental inlays and onlays can be made from porcelain. A good dentist will be able to accurately match the color of your dental inlay or onlay to your natural teeth. Porcelain dental inlays and onlays will also be less likely to discolor than bonded resin tooth restorations. Perfect Fit: The fact that dental inlays are made to fit the broken area of a tooth exactly helps to ensure a perfect fit. When compared to fillings, dental inlays are less likely to have small gaps between the tooth restoration and remaining tooth tissue. Dental inlays and onlays are normally in two visits to your dentist’s office. 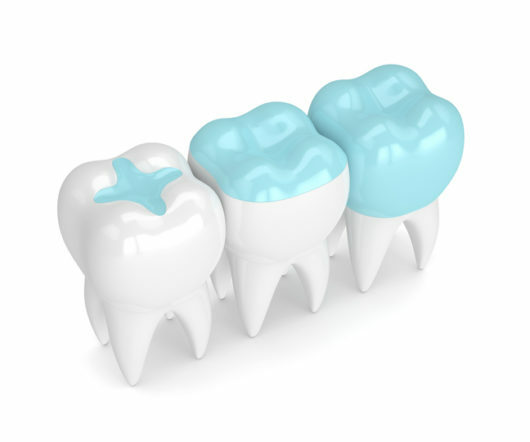 In the first visit, your dentist will prepare the damaged tooth for the dental inlay by removing decayed tooth tissue. After this, your dentist will make a dental impression of your teeth to send to a laboratory. This dental impression is used by the laboratory technician to make an inlay exactly according to the shape of a damaged tooth. After your first visit, your dentist will place a temporary inlay to protect your tooth while you wait for the permanent restoration. During the second visit, your dentist will first remove the temporary restoration, after which they will place the dental inlay or onlay. Once your inlay or onlay is placed, it should last much longer than a dental filling. While fillings cost significantly less than inlays and onlays, they have a shorter expected lifetime and will likely need to be replaced within 5-7 years. Dental inlays and onlays cost between $650-$1200, depending on the damage to a tooth and the material used. This compares well to the cost of a crown, which can range between $500-$3000 per tooth. Because inlays and onlays are expected to last longer than dental fillings and bonding, the extra cost of getting an inlay can be seen as an investment in long-term dental health.